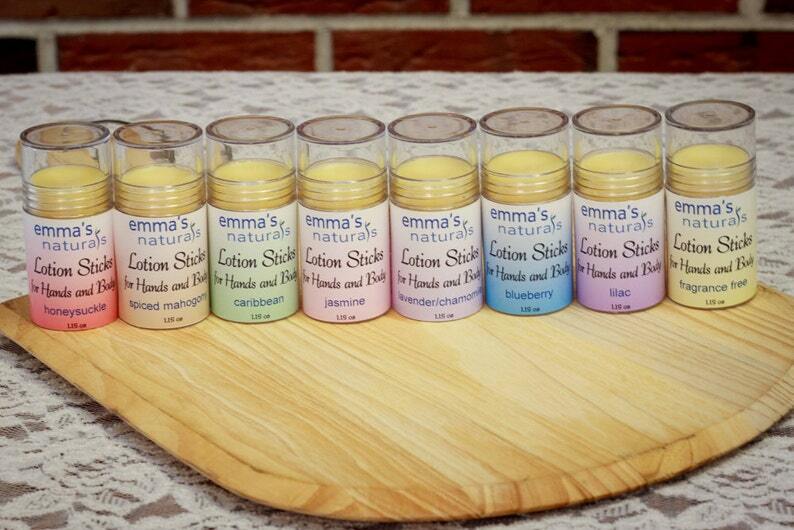 Everything you love about our artisan lotion bars, but now in a fun Lotion Stick! These "push pops" make it easy to apply lotion to yourself or your little ones. This is a favorite for little cheeks - so easy, kids will love to apply themselves! Emma's Natural's lotion sticks will soften with the warmth of your skin as you apply. Light application is all it takes to keep your hands soft and supple throughout the day. Our customers tell us it not only softens dry, cracked skin but helps repair the skin as well. The easy to use container is convenient to stash in your purse, diaper bag, car or at work. 5 SIMPLE INGREDIENTS: Organic unrefined coconut oil, pure sweet almond oil, organic unrefined shea butter, beeswax, and non GMO unrefined Vitamin E oil. You can either keep it fragrance free or add one of our essential oils or fragrance oils. Check our facebook page for updates on new products!